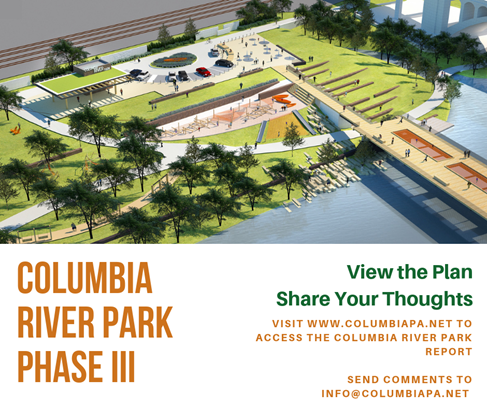 Columbia Borough has released the final draft of Columbia River Park Phase III Report and welcomes feedback on this plan. Susquehanna Heritage has participated with the process to expand Columbia River Park, where Columbia Crossing River Trails Center is located. There is an opportunity to expand the park north of the Veterans Memorial Bridge. Almost eleven acres of river front land will be turned into a beautiful, innovative public park. The space holds important cultural features including two historic bridge piers and canal remnants. Over the last year, designers have collected information, data, and opinions from local residents, visitors, businesses and more. Through a series of public meeting, online surveys, and public events like the Bridge Bust, the designers prepared and refined a plan for the expanded park. View the plan at www.columbiapa.net. Comments on the plan can be sent to info@columbiapa.net.